I could have sworn, in earlier OpenOffices, there was an export of a document to a single, plain-text, so-called "flat" XML file. However, I've looked through the File/Save As menus, and I cannot find anything like that? ... where there is clearly a "OpenDocument Text (Flat XML) (.fodt)" Save As option - which is nowhere to be found on my screenshots above!? Where has the Flat XML "Save As" option gone? I actually want to use this with an Impress document (which has no images, so embedding/linking is not an issue), so I can post back on this forum with a question; what are my options for that? ... so apparently, there are versions that do not support the Flat XML format... So, an alternative question: where is it documented which versions of LO/OO support this "save as" operation, and which do not? And as a subquestion - would anyone know, why was it removed at all? As @Pedro indicates, if you are installing from PPA it may either be a problem with the Ubuntu-provided version or simply an issue of a related package not having been installed. All PPA-supplied versions of LO are generally repackaged by the distribution managers to be compliant with the various customisations each distribution makes. Installing all packages from the website version offers the various flat XML options in the file type selection. Thanks for that, @oweng - I'm not sure, but it could have been the "master" Debian .deb from the LibreOffice site (not the PPA, as I have an older OS, Ubuntu 11.04); I just unpacked the .debs and am actually running it from an "off-tree" folder - that could have something to do with it. Thankfully, installing the .jars as in my post below helped. Cheers! 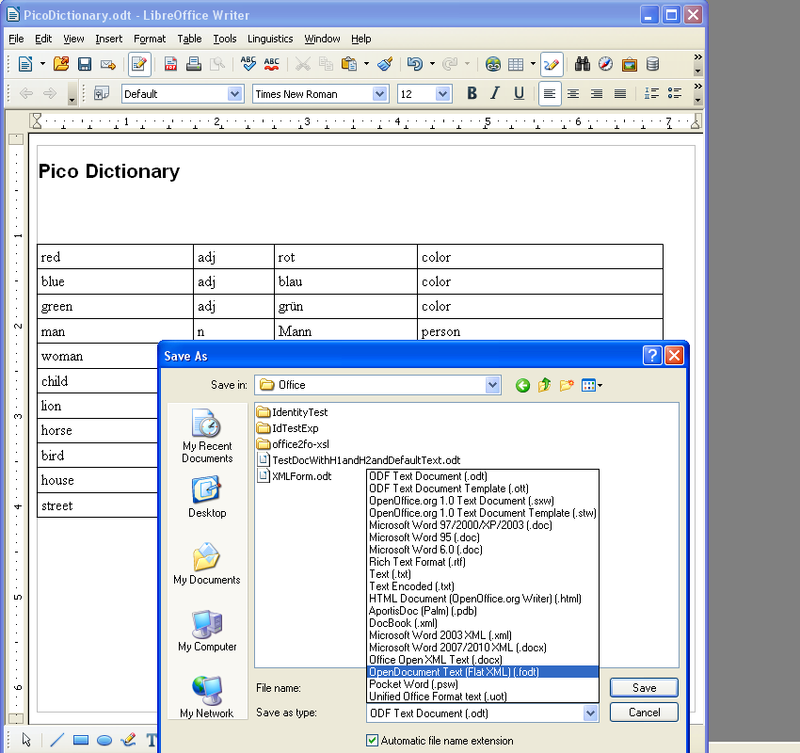 LibreOffice comes with the flat xml format available out of the box. Just use File > Save As, then scroll down the list of file types to "Open Document (Flat XML) .fodt"
On Fedora 15, I had to install the "libreoffice-xsltfilter" from the repository. In was not part of the default installation package. Now and then, a user wants to save an OpenOffice document as a flat XML file, rather than the normal zipped file. If you run linux, you probably already have the flat file filters added. 1. Download the flat filters I have included. ... that is, the old "Due to an unexpected error, OpenOffice crashed..."
@sddau, that must be a Ubuntu (or Linux) problem only. fodt saving is available on Windows without the need for any extensions/hacks. Thanks for noting that, @Pedro - I wasn't aware of the differences with Windows; cheers!